A double-breasted suit has a certain sense of swagger that today’s ready-made, two and three-button suits lack. The charm and heredity of the overlapping suit jacket is an iconic style that has been embraced from Hollywood to the boardroom. Double-breasted suits are hard to come by these days. Due to their dressy cut, most clothing stores shy away from this bold approach to a suit and usually keep with a casual, mass appeal. The following are some tips to keep in mind when picking the perfect double-breasted suit. CUT- The best way to cut and wear a double-breasted suit is in the famed 6-to-show, 2-to-button English model. BODY SHAPE- The double-breasted suit is flattering to any body shape or height, however with this cut especially, it looks best when it is tailored to your torso. Giving the jacket shape at the waistline will create the illusion of more prominent shoulders and will draw the eye up-ward. 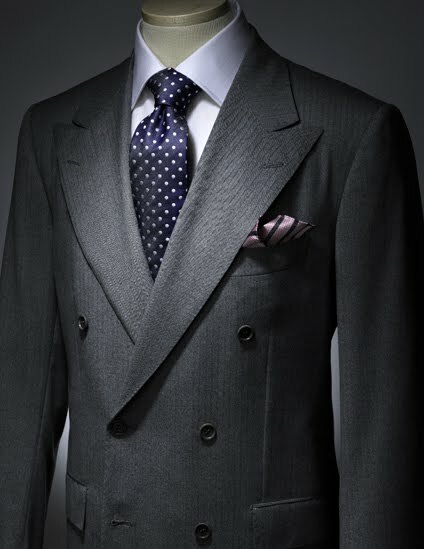 Even if you are more ample in the torso, the overlapping lapels help to de-emphasize your waistline. LAPELS- These suits should always have peak lapels. The peak lapels accentuate the long, lean look that the double-breasted suit provides. VENTS- Side vents are preferred with the 6-to-show, 2-to-button model. This stylish feature also has a functional benefit that the Brits have known about for years; it’s easier to access your pockets when you are seated at your desk or in your car! Do you have any questions regarding fashion/fit, or would like to share a sartorial comment? I invite you to post a question or comment to our blog. 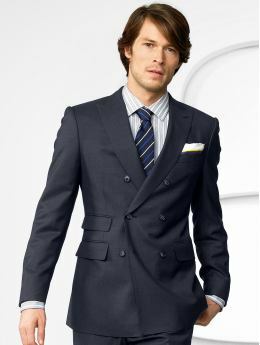 Or for a personal tailor near you, please call 877.ASTOR.18.